Monday morning was really nice and we decide on an easy day of 12 miles. Chris, Cassandra and I leave Uncle Johnny’s around 10:00 and Camaro and Chevy will follow soon after. It is a pretty day, about 66 degrees and just a little overcast. The walk up to the first Shelter is about 5 miles and we set an easy pace. I’m in a really good mood after a nice Easter weekend and allow some distance between us. I am praying and talking to God and just feeling really open to being led…like I said a great day. As I continue to hike I start to hear that I am no longer supposed to be hiking, I fear that despair is descending on me again and I immediately pray for my spirits to be lifted…even though I am not feeling down at all. I continue to hear the same message and now I tried to listen to it more clearly. As I approach the shelter clarity strikes me and I know I need to pray. I sit down, and there are a few people hanging around. Crow is sitting a few feet from me and Chris and Cassandra are just kindling hanging around basically waiting on me. I tell them to go on and that I have some praying to do and that either way they will see me again. I know that they know what I am going to do and they hike on. Everyone else has left and it is just Crow and me. I asked him if he is a spiritual man and he says he believes in a higher power but does not know how to clearly define it. I tell him I am a Christ follower and ask if I can sure my new revelation that had been placed upon me. I tell him what has happened and that I am led to leave the trail and serve, I will still continue north but as a servant not as a hiker. He thinks that is really cool and wishes me the best. I ask him if there is anything he needs and he hesitates. He has just ruined his hiking socks that day so I give him a pair of mine. He lost his gloves a day or so ago so I give him mine. I also give him a warm mid layer and some money to re-supply as he is broke. He is very appreciative as he was going to have a few bad days coming up with out the extra gear I share with him. I pop open the 2 gatorades I was carrying and we have a hiker’s toast. As I ready to leave some section hikers come in and I share my story again, they think it sounds like a great idea and we agree to grab dinner in town. I then start back down the trail, back tracking for the first time in 350 miles. I am so happy and fulfilled that tears are flowing freely and my steps are light as feathers. I see Camaro on the way up and I tell her the news…she is both happy for me and sad that we will not be continuing on together, I give her a hug and start back down the trail. I have changed my status, no longer am I a thru hiker…I am now a Trail Angel, still headed for Maine. You are probably wondering what a trail angel is…basically, it is a local person to a certain section of the trail that is willing to help hikers in need. I am taking it to another level, I’m going to continue north to Maine but be a trail angel along the way as well as providing trail magic as I go. 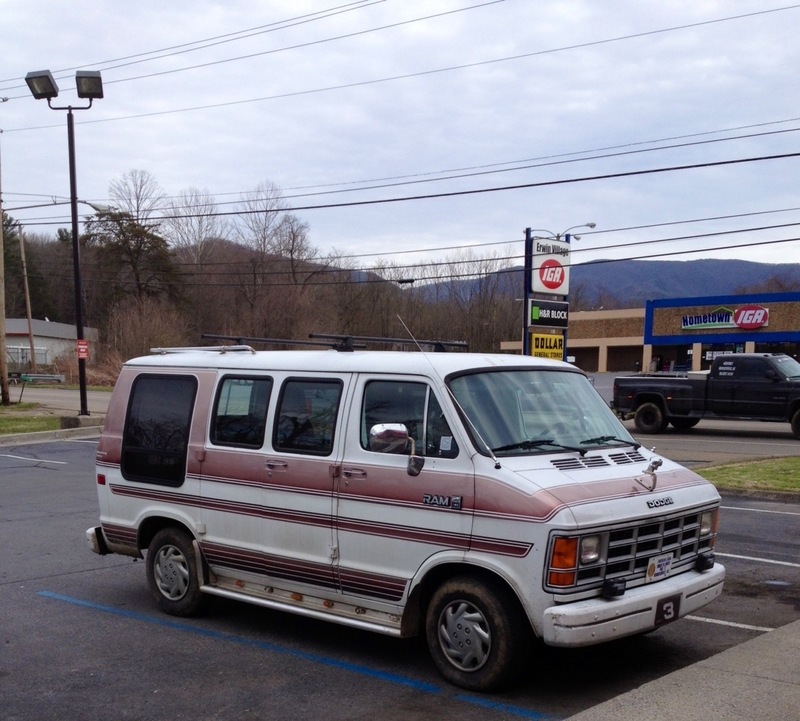 I know that now I will need to get some wheels and Grim (runs Uncle Johnny’s) offers to sell me his old 1990 Dodge van (he has been letting me use it to drive people into town). It is actually the perfect vehicle for what I need to do and really fits the the thru hiker motif. I get up with the plan to meet Chris, Cassandra and Camaro and of course Chevy and do my first actual trail magic by providing them lunch on the trail. I see Shutter Bug walking around (she is giving an ankle injury a chance to heal) and ask if she wants to join me. We head up to Walmart for lunch supplies and split the tab. I had asked two brothers who were staying with me in the cabin to let them know we would be coming up there (they were slack packing south today so would pass them). The plan was to meet at Iron Mountain Gap, but as we are driving up there Chris calls and tells me they are already there. I tell them to go on to the next gap and we would meet them there (another 4 miles). The next gap is Greasy Creek Gap and we can only drive as far as the Greasy Creek Hostel (actually the owner calls it a “friendly”) we park and are told we have an almost .75 mile hike to the trail. We walk up a narrow, wet cart path, I’m in crocs and Shutter Bug is in flip flops and socks. It is tough going avoiding the run off of melting snow and carrying about 4 grocery bags each and we are not even sure where the trail crosses our path. I decide to leave her with the food and hike further up to see if I can find the trail. I go up a side trail a little ways and see some hikers! It is Joe the Hiker and Hoosier and another friend of theirs. Joe is a believer in a similar situation as me and Hoosier is a retired pastor being the Body upon the trail. Joe goes back with me and helps me with the food and we start to get things set up. Shutter Bug is telling Hoosier about her ankle and he takes her aside to pray for her…it is a wonderful thing! They take off on down the trail and in a few minutes we see Chris headed our way, with Cassandra, Camaro and Chevy right behind…I see Chevy first and call her name and she come running up, tail wagging to greet me! We help them prepare a lunch of hoagie style sandwiches, salad and snacks. We have avocados, carrots, spinach, strawberries, grapes, Oreos, chips, pudding cups and I think that is it. As they are eating Manchild, Trail Mover and Sandman come down the trail to join us. A few more hikers come in and finish off the meal. I tell them of my plan to buy the van and continue north as a trail angel. Chris already liked the van idea and they are glad to see me with clarity and following where I am led, they will miss me hiking but are exciting for what I am going to do. We say goodbye and they head on down the trail. Shutter Bug and I chalk it up as a big success for our first trail magic and we have a good conversation on the way back and stop for lunch. I start some of the steps to buy the van and will plan on heading out in the next day or two. I am still Nomad on the trail, but now I am doing what I have always been led to do…love and serve others. The blog will continue, the adventure will continue God has just added a new twist.